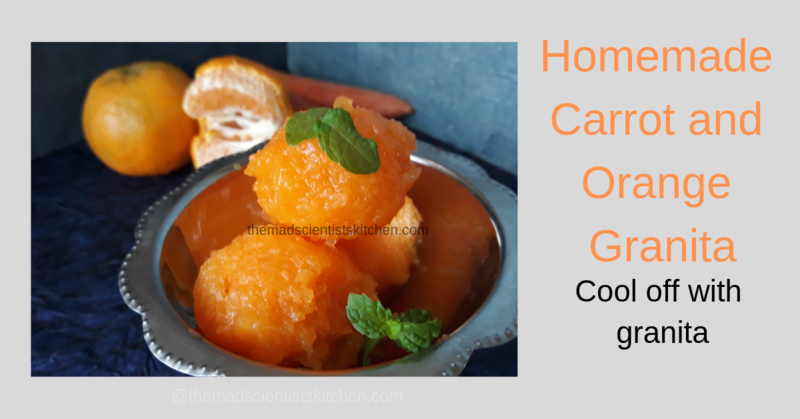 Homemade Carrot and Orange Granita! A welcome way to beat the heat! Because summer means no school and I can sleep till 7 am, mangoes, watermelon, no cooking but basically the girls have holidays. We work at a more leisurely pace. Then the heat starts and living in Goa means the humidity soars up, even as I type this post the humidity is 75%. So it just zaps you up. So we start looking for foods that cool you down. The most loved being “Masuru Anna” Curds rice, then buttermilk, various mocktails like Cranberry Sangria~A mocktail, shakes and how can we forget ice creams or Phirni. There was a time I emptied the freezer and made ice creams at home. The girls had a gala time many times because of the heat they skipped meals and the nanny took the easy way out and gave them ice creams. I used the CMS power and alginet powder until I started thinking do I want these chemicals in our tummies. Now we go out for ice cream we may buy a tub and that is okay with me, portion control. The other day, Apeksha shared an image with me and then told me she had this carrot, orange sorbet topped with coffee ice cream. She said she was told it was carrot orange gelato but I felt it was a granita. Then it can also be called a carrot orange sorbet. As we discussed the tastes I was intrigued enough and I made it the very next day. Confusing? If you too are wondering what are the difference between granita, sorbet, gelato, ice cream, and sherbet. Remember in India Sherbet is a drink! Differences Ice crystals give a granite texture and are crunchy. A granita is not churned No milk is used. Flavours with herbs and spices. Whipped to lighten the texture. The flavours are very intense. Is churned. Sherbet in India is a drink of fruit juice (commonly lemon) with sugar and salt. Creamier than sorbet and lighter in texture and flavours are less intense. Is churned. Texture as more milk than cream the fat content is lesser. Lesser air is churned in. the Sugar content is higher. A good gelato is best consumed within a few days of making. The texture is smoother as more cream is used. Fat content is higher than gelato but the amount of air churned in is also more hence is softer and smoother. Stored at low temperatures so can be stored for months. Storage – – – Stored at a higher temperature so softer, melts easy but is smooth Stored at low temperatures so can be stored for a longer period. It is The World Carrot day on 4th April and thanks to Poonam I have already posted Oven Roasted Carrots. the rest of my group members of FoodieMondayBlogHop shared out carrots recipes do check them out they are really innovative. With Ugadi/Padwa round the corner I wanted to make something festive but nothing too sweet. I am the only one who enjoys sweets and can eat them. Rest of my family are either not allowed sweets or do not like them. So I have made this Carrot, Orange Granita. Carrots are popular in juices and being naturally sweet are ideal for granita and sorbet. 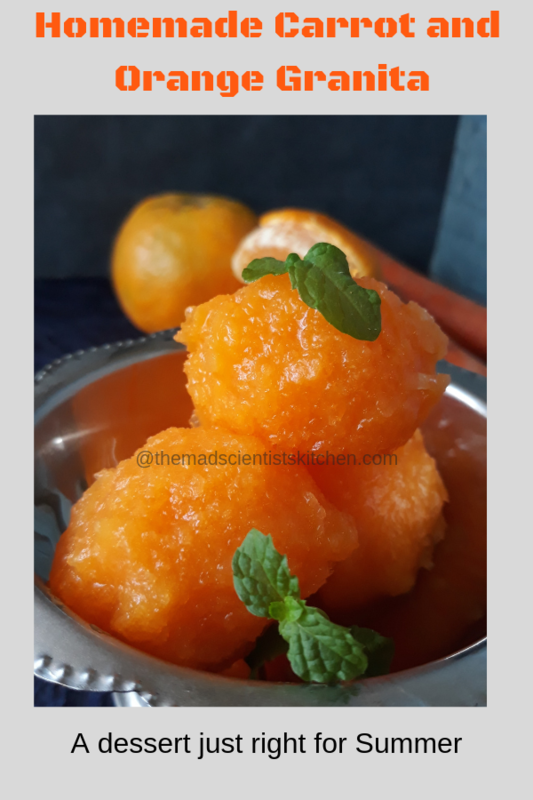 The Orange season is coming to an end in Goa so using the last of the oranges I made this delicious granita. I have avoided using mint while crushing the carrots as my Father-in-Law does not enjoy mint. But do add it as the flavours are intense and enjoy a refreshing dessert. You can also use liquor like vodka to flavour your granita. 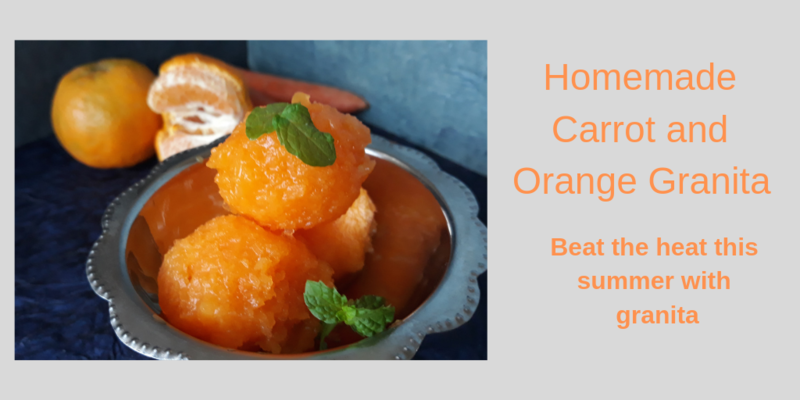 Use the goodness of carrots and oranges to beat the heat! Cut in roundels and transfer to a bowl, add a cup of water and pressure cook in the cooker for 2 whistles. Let the pressure drop naturally. Remove the carrots and cool them completely. Meanwhile, peel the oranges remove the segments slit open, discard the membrane and seeds. Better to do this in a wide bowl this way the orange juice is collected too. To a blender/mixer, add the carrots, sugar and the water that you have used to boil the carrots. Blitz till the sugar is well mixed and all the ingredients are well crushed. Adjust the sugar, add the lemon then add water as needed. The amount of water you need will depend on the orange juice you have. Transfer to a flat container and set in the freezer till the juice freezes. Actually, you have to remove from the freezer and use a fork to scrape and stir the granita. Transfer back to the freezer. Do this at least 2 times. I did not I just scooped the granite and shaped it into these cute balls. Few of us who have on the occasion of the International Carrot Day on 4th April posted carrot recipes. Do check it out. 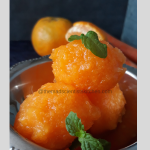 I love both orange and carrot flavors and this easy granita looks absolutely fabulous di ! Perfect treat for the weather here at present ! Very nicely explained the differences between various frozen desserts!! The granita looks so tempting.. perfect for summers.. lovely share Archana!! Wow Archana granite looks so beautiful, refreshing and delicious. I wish I could grab from the picture. Awesome share.